When Remi Tessier recently decided to open a pizza franchise, he got a big surprise: it was not going to be easy to get financing from a bank. So Mr. Tessier turned to another source of capital, his franchiser. He financed the $250,000 cost of opening his pizza restaurant though a leasing program established by Marco’s Pizza to help franchisees unable to obtain traditional loans. The case is one example of a trend that is rattling the chains of franchising: facing a $3.4 billion credit shortfall, franchisers are trying to spur growth by offering franchisees new financing approaches and incentives. Chains are facing the worst credit squeeze since the franchise model boomed in the years after World War II. This year, the franchise industry is expected to seek $10.1 billion in capital, but banks are expected to lend only $6.7 billion, according to the International Franchise Association. The big national companies that dominated franchise lending before the 2008 collapse have stopped or reduced financing. The remaining lenders — often local banks — have been more restrictive in their credit underwriting, and they have been demanding more collateral (like home equity), more cash liquidity, more experience in the industry and outside sources of income, like rental income or a working spouse. Robert C. Seiwert, senior vice president of the American Bankers Association, said the tighter credit standards affected first-time franchisees in particular (especially those trying riskier ventures like restaurants). Beyond the concerns about lacking collateral, experience and cash flow, lenders are often wary of franchisees who are unable or unwilling to make a large equity investment in their business. And lenders are likely to be especially cautious with newer chains that lack a track record. Some franchisers have gone a step further and put their own balance sheets to work by creating captive financing programs, pooled credit support or leasing programs. Others have tried “credit enhancement” in which the franchiser guarantees part of a loan to encourage tight-fisted lenders to free capital. Some franchisers are submitting themselves to the bank credit report process — essentially getting their credit-risk language translated into banking terms — so that franchisees have a lender-friendly package ready to take to banks that might have never seen a loan application from a particular chain. Besides financing, many franchises have also taken steps to help potential franchisees by reducing fees, waiving royalties or reducing square-footage requirements. 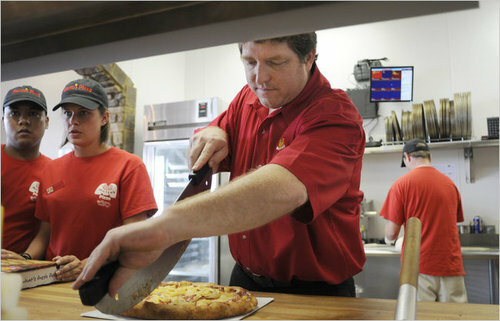 Whatever the tactic, the motive is the same: playing a more active role in helping franchisees gain access to capital. “We had to get into the financing space to be able to deliver a solution to our franchisees,” said Peter Taunton, founder and chief executive of Snap Fitness, a national gym chain based in Chanhassen, Minn.
Marco’s Pizza is one of the most aggressive franchisers. A 200-store chain based in Toledo, Ohio, Marco’s has ambitions to grow fivefold in the next five years. Those plans — which will require $100 million in capital — ran into a major roadblock when banks curtailed lending. So Marco’s has introduced three financing programs. That is what Remi Tessier found. After 10 years in the liquor business and four children, he had decided he wanted to switch to a more family-friendly business. Pizza seemed a good bet because he thought it was recession-proof. At least that is what he thought until he tried to get financing. A decade earlier, he had obtained a business loan for his liquor store with 10 percent down. When he decided to open a 1,600-square-foot Marco’s Pizza franchise in Warner Robins, Ga., he assumed he was a better candidate for a loan with $300,000 in the bank, $9,000 monthly income from the sale of his liquor store and a credit score around 800. So he turned to the franchisers of Marco’s Pizza and applied for its leasing and assurance programs. He financed the $250,000 cost of opening his store by putting 25 percent down and will repay the rest to his franchiser over eight years. “I was approved within a week,” he said. In April, he opened the first of three planned locations.